Dezeen is the top platform for comments on architecture and design and one of the most commented websites in the world, according to a survey of reader interactions. The monthly Comment 1000 survey, which ranks every website according to the number of reader comments it attracts, places Dezeen at number 851 in its most recent table. This makes us the highest-ranking design site in the world, since no other architecture or design titles feature in the list. "Your website was listed as one of top 1,000 commenting websites on the web," said Comment 1000 in an email informing us of the ranking. "Based on the results, dezeen.com scored very high on commenting in September." Dezeen has a vibrant community of commenters who post hundreds of comments every month. We have recently changed our approach to comment moderation, taking a harder line with abusive commenters as part of a move to make our comments section friendlier and more constructive. 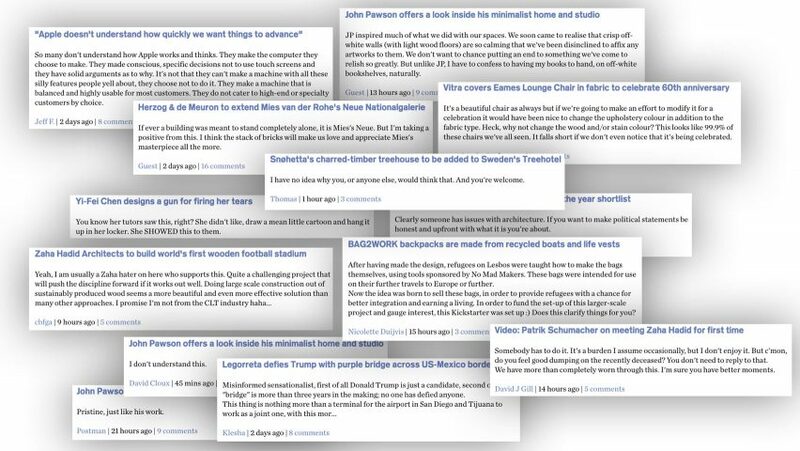 Dezeen authors now regularly post comments themselves and respond to readers' questions and observations. We also publish a weekly update of the most vibrant comment threads and summarise the most-discussed stories in our Dezeen Mail newsletter, which goes out every Thursday. You can subscribe to Dezeen Mail here and catch up on all the latest comments here.